I pulled out my SU! owl punch and had a play with it recently, making this birthday card for my stash. It started with a water-colored background piece of cardstock that was embossed with a Sizzix folder. I used several different distress inks and finished it with a few Copic highlights. The owls and branches were done with snippets, and the upper tree branch was done with a MB Woodland branch die and some soft suede cardstock, where I added some punched leaves for greenery. The stamped sentiment from SNSS was heat-embossed with white ep on black and it's all on a pumpkin pie card base. Simon Says Stamp Wednesday Challenge - emboss it! Thanks for the visit today and I hope your day is just perfect! Great card Carol! I adore the owls and also how you created such a perfect tree and branches for them! This is really cute! I like the owls turquoise tummies! The background looks nearly like real wood! A great card for your stash! Seems like these two hooters have lots of places to be! Good for you, playing with the Distress Inks. Great background. Still can not believe they altered this punch. Great scene! These owls are soooo cute and the embossing on them looks great!!! Love the embossed wooden background, too! 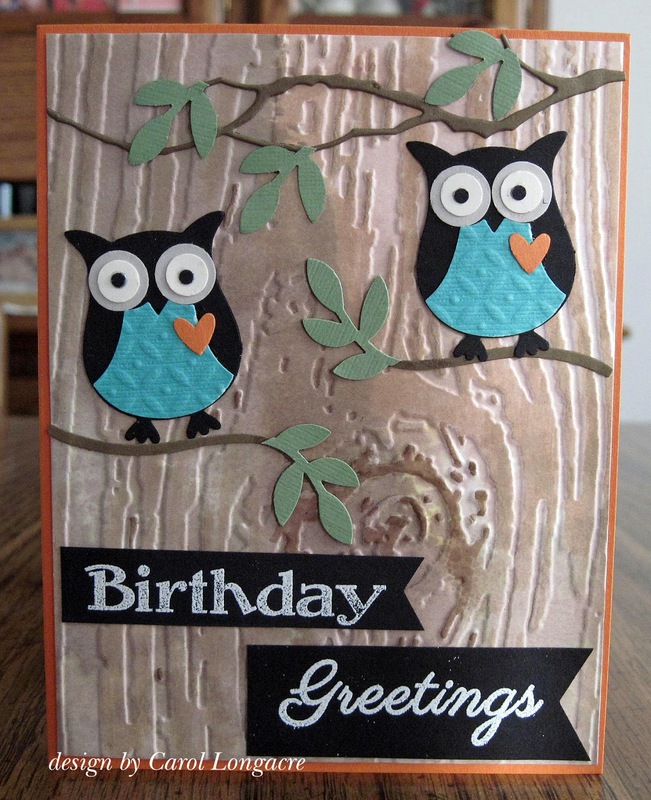 A super card Pia, cute owls and lovely embossed background. I love the owls Carol, they look so cute and comfy on the super tree you made for them. To cute! Be ages since I played with my owl punch. Love the way you split up the sentiment like that with the 2 different banners. It's a great punch and it's made a great card. A gorgeous card made with this super SU punch. WOW! Love all the texture and embossing, beautifully put together Carol. Adorable card! Love those sweet owls! Great design! What wonderful owls hanging out in the branches together. Love that woodgrain background-looks like bark! 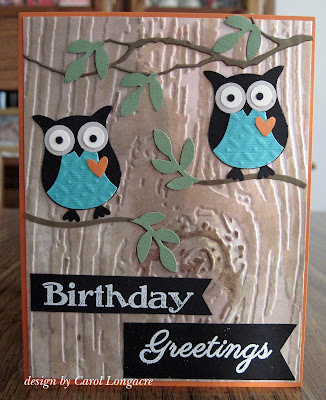 Adorable owl Birthday Card! Thanks for joining us at HLS Anything Goes with Dies!